The UMass Amherst Campus Master Plan Sustainability Chapter articulates the manner in which the Campus Master Plan 2012 principles translate into specific recommendations for campus systems development in support of future smart growth. It summarizes the current physical campus-scale planning projects that Facilities & Campus Services have completed during and after the Master Plan process, and incorporates other operational and educational initiatives that have engaged our campus community as we plan for sustainability. The CMP Chapter is organized in three major sections: i) sustainability overview; ii) campus master plan systems; iii) current initiatives; and iv) next steps. 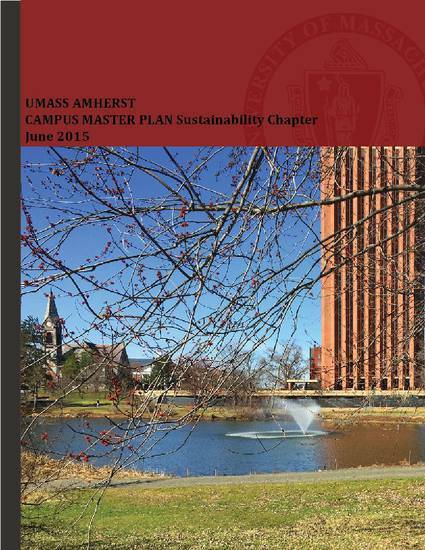 The first section provides the context for sustainability planning at UMass Amherst and summarizes key drivers, such as the Climate Action Plan of 2012 and our approach to greenhouse gas emissions accounting. The second section articulates the Campus Master Plan 2012 systems approach to sustainability and reviews other completed operational initiatives in infrastructure and facilities planning. The overview of current initiatives describes major efforts to advance sustainability across the campus community and is the basis for outlining the steps that Facilities & Campus Services and Sustainable UMass plan to take to advance the goal for a carbon neutral campus.